The science and ingenuity of creating clean, quality portable power is constantly evolving. Let’s tick off some technological coolness: tri-fuel availability, ultra-clean diesel power plants, high-tech interactive control panels, telematics, paralleling, remote operation, power distribution boxes, hurricane-resistant enclosures and beyond. The list of common and cutting-edge systems being engineered into portable, enclosed generators today is pretty impressive (considering they just look like big, boring metal boxes). Like a digger or dozer, electricity needs to be precise, and that means creating power that meets the exacting needs of renters and contractors. Not long ago, gen sets lacked the clean, accurate power to operate precision electronics and power tools and the amount of power service to run large commercial or industrial operations. Today, thanks to advancements in everything from computerization to the tensile strength of materials, manufacturers are making radical leaps in the amount of power they can build into a reasonably compact package. 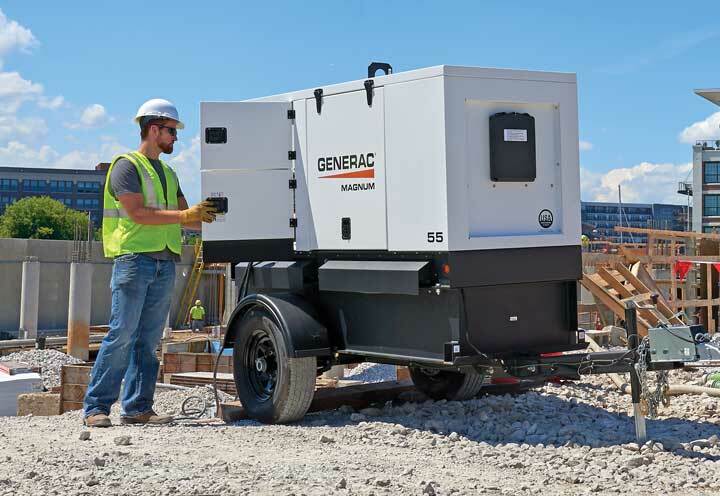 In addition, specialized add-on equipment, from workhorse distribution panels to energy-saving hybrid fuel systems, are increasing the efficiency and relevance of compact generators for commercial and industrial concerns. Your dealer and rental house are great places to start some hands-on research. Commercial generators are benefiting from miniaturization and other technologies that are allowing manufacturers put more power into a small package. Commercial generators are benefiting greatly from miniaturization and other technologies that are allowing manufacturers to put more power into an efficiently-sized package. Today, it’s possible to find fully portable generators with working power ratings into the hundreds of kilowatts. These power plants carry some pretty sophisticated systems. It often starts with the advanced power panels being built into compact, enclosed generators where operators can access key operations and information. Power distribution gear, which gives operators access to a generator’s power supply for everything from charging cell phones to powering outdoor lighting, are becoming increasingly sophisticated. Not only are cool power panels being built (mentioned earlier), but companies can now purchase well-equipped, highly portable, Nema 3R-rated power distribution boxes that offer transformer, step-up/step-down and other capabilities in a single piece of equipment. For companies using generators in remote locations, whether they are running sprinklers on a farm or empowering operations in remote oil and gas projects, perhaps no development is more exciting than the growth of telematics and remote controls. Operators and their service companies can receive maintenance reminders to schedule service, monitor and act upon warnings, overloads and other alerts and even resolve engine problems — all from a remote location. Telematics can monitor technologies like Tier 4 Final diesel engine aftertreatment systems, which are making generators cleaner. Here’s a refresher: The most stringent yet of the EPA’s regulations for off-highway diesel engines, known as Tier 4 Final, hit the majority of small diesel engine power ranges in 2015 and 2016. Tier 4 Final has diesel designers from Kubota to Perkins creating smarter, more complex and cleaner-burning power plants, but these engines will come at a price increase and may include new technologies, maintenance and fluids (but also more advanced features, fuel efficiency and cleanliness). 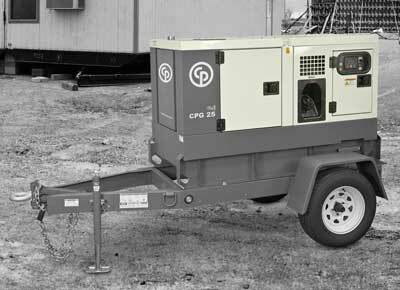 Considering engines, another area where manufacturers are making strides with portable generators is in fuel source options. New bi- or tri-fuel add-on systems are enabling diesel generators to use natural gas or some other variant, saving fuel costs compared to burning diesel fuel alone. 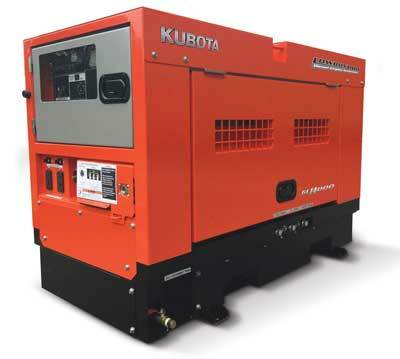 Being fully enclosed, Kubota engineers are able to minimize noise to roughly 66 to 68 dB at normal operation, which is convenient for use in populated areas. Other cool developments separating different brands include things like: Hipower Systems, a manufacturer of power-generation and power distribution equipment in the United States and Canada, recently announced that the enclosures used in its prime power and standby generators have been certified by an engineering firm to withstand winds up to 180 mph (think portable power units used in a hurricane). Also, enclosures in general are being engineered to keep noise levels super low. “Being fully enclosed, we are able to minimize noise to roughly 66 to 68 dB at normal operation, which makes Kubota units very convenient for use in populated areas,” says Odden. High-performance engines are delivering increased fuel economy, and powerful motor starting capability and reliable operation in extreme conditions. Tier 4 aftertreatment technologies on diesel engines are producing barely any emissions, and many systems are utilizing diesel oxidation catalysts (DOCs), shying away from diesel particular filters (DPFs), to be increasingly maintenance free. Another customer-driven feature is increased fuel capacity. Doosan Portable Power’s new G25, G50 and G70 have increased onboard fuel capacity for runtimes in excess of 24 hours at any load factor; an optional 48-hour runtime solution is available on the G25 and G70 models. Further expanding the models’ versatility is a dual-frequency feature that allows an operator to select 50 or 60 Hz, dependent upon the application, and a multi-voltage selection switch. All of these developments are significant, and they only hint at the future of power equipment advances. We predict that the market for portable generators will continue to accelerate, especially with the increasing demand for backup generators to protect against weather outages and grid overloads. That growth should drive manufacturers’ efforts to give companies the power they need in an ever-more functional yet compact package. It’s an exciting time for portable power. Hipower Systems, a manufacturer of power generation and power distribution equipment in the United States and Canada, recently announced it is finalizing the purchase of a $24 million, 515,000-sq-ft industrial building in Olathe, Kan. Located at the corner of 167th Street and Lone Elm Road, the building will become the firm’s new corporate headquarters when it opens (tentatively slated for September 2017). All operations — from design, engineering and manufacturing to sales and support — will be housed within the new facility, including production of the firm’s upcoming, newly designed and engineered, Tier 4 Final-compliant portable generators. For more info on gen sets, power up through this link!